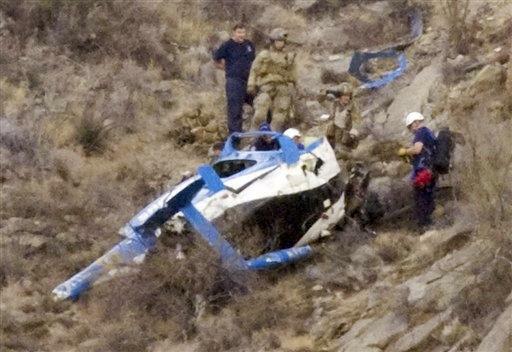 TUCSON, Ariz. (AP) - A Pima County Sheriff's Department helicopter crashed on the side of a rugged mountain Monday, killing the pilot and injuring all three passengers. Authorities said one person was in critical condition at a Tucson hospital, and the two others were in serious condition. Sheriff's officials said pilot Loren Leonberger, 60, had been with the department since November 2008. He was a Vietnam veteran with more than 40 years' experience flying helicopters and previously was a pilot for the Army National Guard, Maricopa County Sheriff's Office and Arizona Department of Public Safety, officials said. Sheriff's officials wouldn't immediately confirm whether the survivors were department employees. The Hughes 500 helicopter went down on Waterman Mountain about 11 a.m. Monday as the four-person crew was scouting an area in the Ironwood National Forest for possible locations for radio communications towers. Federal Aviation Administration spokesman Ian Gregor said the helicopter crashed under unknown circumstances in mountainous terrain about 39 miles northwest of Tucson International Airport. Gregor said officials from the FAA and National Transportation Safety Board would be investigating the crash. Rescuers had to hike up Waterman Mountain to reach the crash site, which is in rugged terrain inaccessible to vehicles. Once at the site, the rescuers put the passengers in baskets that were lifted by a rescue helicopter overhead, according to Deputy Jason Ogan, a sheriff's department spokesman.